Stories Of A Happy Mom: Crazy week, sick house! As if it wasn't enough with Gaby's ER visit, this weekend we also had to deal with Olivia's sickness as well as Iggy's and my own! It was crazy! Gaby is doing MUCH better.. the swelling in her eye is gone now and she is acting fine.. totally ready for her birthday party this Sunday! She needs to be on antibiotics until Monday, but she should be fine! Olivia had a fever for 2 days straight.. she had a crazy cough and her temperature reached up to 103.. not fun at all! She even missed school for those two days, but she's much better now.. again.. just in time for her birthday party! .. and last but not least.. ME! 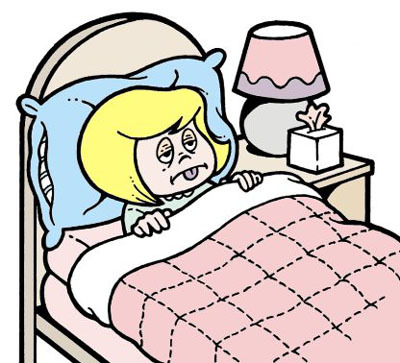 I'm super sick as well.. got a crazy stomach bug two days ago followed by nausea, congestion, headache and overall sickness... I took some time off from work to recover by the weekend and be ready for all the festivities! I hope we're all fine by Sunday! Wish us luck!